You Can Still Get the Blood Lies Bundle! 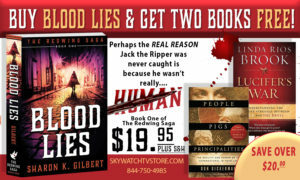 The SkyWatchTV Store is still offering the Blood Lies Bundle, but you have to hurry before all the copies are gone! You could pay $19.95 for just the book, or buy the bundle and get two additional books on spiritual warfare for FREE! Go to the SkyWatchTVStore to order today before supplies are all gone! ← We’ve approved an early release for Blood Rites!